Is John Rentoul right about June 27th 2007? Was this the moment that Labour was “doomed”? Is Rentoul being unfair. Was Brown always doomed to defeat or are we, even at this stage, being premature? On the face of it the polling numbers point to defeat – but they are better for Labour than they were in mid-September 2008 just before the Lehman Brothers collapse. Events could still intervene and prevent the seemingly inevitable progress of Mr. Cameron towards Downing Street. It is possible that he’s squeezed out of an overall majority but very few pundits are suggesting that Labour could end up as top dogs. Labour strategists are keen to point to 1992 when John Major apparently came from certain defeat to win by an overall vote margin of nearly 8%. But Major was in a vastly better position than Brown is today. The December 1991 polls had the Tories hovering around 40% – a huge difference compared with Labour’s current standings. The polling thresholds for me are the Conservatives at 37% and Labour at 32%. If most of the firms get into that range then maybe Brown could pull off a Houdini act. This is my last post of 2009. Let’s see what the new year brings. Is this the New Year’s message that Labour didn’t want to hear? What do we make of Kellner’s assessments? 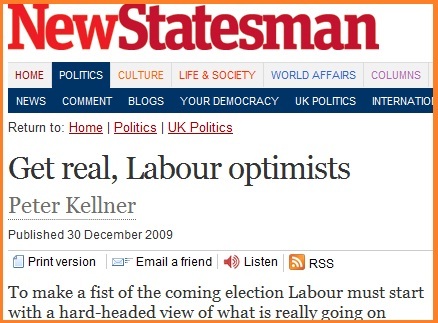 There’s a good assessment of the scale of the challenge facing Labour in the latest News Statesman from the president of YouGov, Peter Kellner, in which he examines the elements behind the recent revival in the party’s hopes. Kellner’s themes will be familiar to PB regulars. It’s that last judgement that is the most controversial – certainly within Labour ranks. But as I always remind people John Major’s government was leading on “the economy” in the final ICM polls before the 1997 general election – and we all know what happened. Unless something happens that totally changes the agenda it’s hard to see anything other than David Cameron entering Downing Street. What will this chart look like on polling day? How electorally sensitive is the price of petrol? 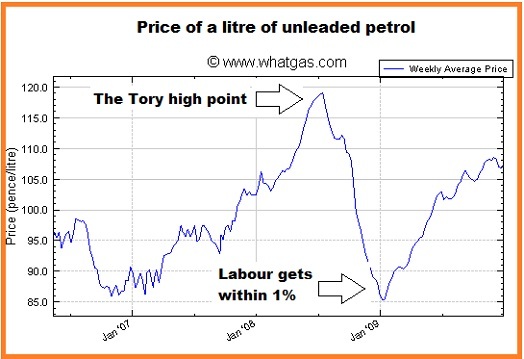 The above chart shows the average pump price for standard unleaded petrol over the past three years and one thing is striking – the high point in price in July 2008 coincided with the Tories achieving their best poll shares since the 1980s. So how critical in terms of votes is the price of petrol and what could be the impact if unleaded moves back to July 2008 levels or even worse? A secondary issue is whether all constituencies are affected equally or are the English middle-sized towns, where many of the marginals are, going to be hit more. For it’s in these places where public transport can be very limited and where the motor car is much more important. With several papers reporting this morning that petrol could rise to Â£1.25 a litre then changes in the above chart could be a key election predictor. Who is the PB Betting Tipster for 2009. Choose one. Voting starts immediately and will continue until 10am on New Year’s Day. Please note that the modestly titled “The Twin Towers” is a join entry from two of the site’s leading gamblers who have similar user names. My vote has gone to Morus (Greg Callus) for his 50/1 Cathy Ashton tip. Greg is one of the sites guest editors and the editor of the newly published “Total Politics Guide to the General Election”. Do the Tories do best if more people are voting? The chart above shows the actual number of votes cast for all parties from 1979 to 2005 and also the total of votes not cast (the paler blue line) from within the overall electorate each year. 2.The Labour and Liberal Democrat lines are also a mirror image of each other, reflecting across a dotted trend line for their average (which is itself on a slight falling trend). This suggests that the long-term key electoral strategy for the Conservatives must include a big element of getting the vote out, engaging the electorateâ€™s wishes and keeping the political centre right happy. Maybe the UK is an essentially conservative country â€“ but one which struggles from time to time with the Conservative party! The Tories are not fighting Labour or the Liberal Democrats but apathy. For the political left it suggests that Labour and the Liberal Democrats feed off each otherâ€™s votes and that their success strategies should focus heavily on competing to attract each otherâ€™s voters. The trends suggest it is as if this fight is independent of the Tory fight against DNV. Maybe this is something of a long running civil war within the political left – and therefore more based on leftwing ideology and less on addressing what the non-voters actually want (as that may not jive with the ideology). If true, it might explain the falling trend. No wonder Cameron is love bombing the LibDems â€“ every vote they get eats into Labour alone and increases his chances of getting a majority. Note that the Tory absolute vote result is intimately connected to turnout – equal to turnout in % divided by 3 and then minus 11.5 million (essentially the Con + DNV trend line) to within 2% for every year apart from 1997. 1997 was thus the only election year out of 8 in which the â€˜Leftâ€™ (Lab + LibDems) takes votes (in absolute numbers terms) away from the â€˜Rightâ€™ (Tory + DNV) â€“ well done Tony Blair. DNV has a core vote of about 10 million and it seems as if pretty much ALL â€˜returningâ€™ votes at higher levels of turnout go to the Tories. Also noteworthy is that the total vote of the â€˜Leftâ€™ is a lot less than the total vote of the â€˜Rightâ€™. DNV has been much the largest political party for over a decade and correctly understanding and influencing their desires and behaviour is the key determinant for the outcome of general elections. Polls would be much more useful if they also stated an assumption of turnout, as the DNV element is clearly a core driver of results and polls and turnout are not independent events. Models for predicting election results in terms of seats won should use both poll data and turnout assumptions. I think the 2010 general election is going to have a big turnout â€“ and that will result in a big Conservative victory. Patrick is a regular poster on PB – this is his first guest slot. What does the Brighton poll say about tactical voting? Is it about who is best placed to impede the Tories? I’ve now got the full dataset from the ICM poll of the Brighton Pavillion constituency which suggests that the party could win its first ever Westminster MP at the general election – the headline figures, with comparisons on the 2005 general election in the seat. But it’s the detail of the poll that could have CCHQ worried. For this shows even in a current Labour-held seat a great readiness by those who supported Blair’s party in 2005 to switch and use their vote in a way that might most hinder the Tories. Thus while only 52% of 2005 Labour voters are sticking with the party 27% say they are voting Green. This is even more acute with the Lib Dems where 29% of the 2005 voters now plan to vote for the Green candidate, the party leader, Caroline Lucas. It’s these big movements which are behind the headline figures. What the mere fact of having the poll is likely to do is to reinforce further the Green’s position as the party that can stop the Tories thus encouraging more tactical switching – hence the reason why the Green party commissioned it and are making it public. The dynamic shown here is probably good news for the Lib Dems in three-way marginals. If they can show that they are best placed to stop the Tories then you can see a lot of Labour switching – even in seats currently held by Brown’s party. It should be noted that the sample size was just 533 which with all the other calculations comes out at about 5%. I’ve just got another Â£100 bet on, this time at 6/4, with Victor Chandler that the Greens will win a seat at the general election. It looks good to me. Have Iain Dale’s voters been a bit premature? How could they support an untested firm? I’m sure that my friends at PB’s pollster, Angus Reid, won’t be too upset to learn that I did not vote for them as “pollster of the year” in Iain Dale’s annual elections. The Vancouver-based firm only started publishing UK voting intention surveys in October and clearly have yet to go through the process of having their findings tested against real results in an actual election here. The only test that we’ve had during 2009 was the Euro elections on June 4th when both YouGov and Populus came pretty close in the battle for top pollster. My vote went to one of these two. Although AR has a big international reputation it is new to the UK and its methodology challenges some British polling orthodoxies. A major area is the way it operates it past vote weighting formula. ICM, Comres and Populus don’t weight to the actual result of the last election but a notional one designed to deal with the problem of “false recall”. For some reason more people say they remember voting Labour than actually did so and the pollsters weight to a notional 2005 outcome that usually has Labour about six points ahead against the actual margin of 2.9%. Not so Angus Reid. It weights to the actual 2005 result – and this is one of the main reasons why it usually reports smaller shares for Brown’s party than the other firms. Are they right? Who knows at this stage – but this is how the AR approach did at the last Canadian elections just over a year ago. The UK of course, is different, but I was hellish impressed by this table when the arrangement between PB and Angus Reid was being set up. 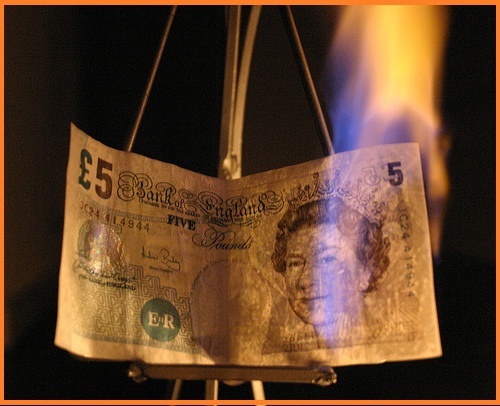 How much will you be down on “Money Burning Day”? Are your end year bets as bad as mine? December 31st is generally an important day for political punters because so many bets are linked to the end of the year. And for me, New Year’s Eve 2009 looks set to be one of the worst ever. In fact I don’t have a winner but I have a lot of losers. It’s generally quite instructive to look through your losing bets to pick up ideas that might contain losses in the future. “Will Baroness Scotland remain in her position until the end of 2009?” – a reasonably-sized bet staked on September 22nd when things looked a bit doubtful. She’s still there. “Will Alistair Darling cease to be Chancellor in 2009?”. Two chunky bets staked on April 24th and June 7th at 9/2 and 3/1. That looked like a winner until the Chancellor refused to give up his job to Ed Balls in the June re-shuffle because Brown was in such a weak position. Balls had even gone as far as saying farewell to what he thought was going to be his old department. Darling is still there. “Ed Balls to be Chancellor on 31/12/09”. A nice sized bet staked at 16/1 on January 5th 2009. Ed didn’t make it. 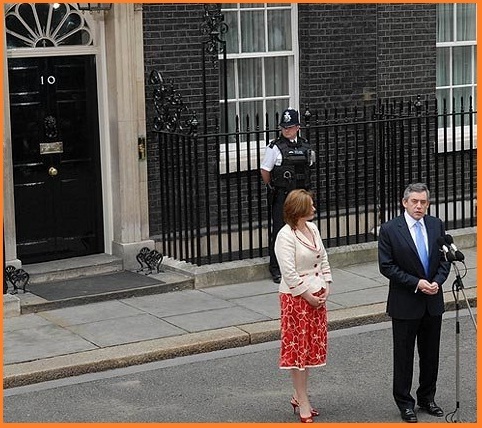 “Gordon Brown To Leave PM Office in 2009.” A big bet placed in May 30th at 5/2. Brown is still there. “Peter Mandelson (200/1); Jacqui Smith (200/1); Alistair Darling (50/1); Jack Straw (40/1); Harriet Harman (25/1) to be PM on 31/12/09” mostly modest bets staked in January 2009. None of them made it. “David Blunkett (100/1), John Reid (100/1) and John Denham (33/1) to be home secretary on 31/12/09. Smallish bets staked in January 2009. None of them made it. Looking back at them they all seemed reasonable punts at the time and I don’t regret any of them. And lest you feel sorry for me the total losses represented above were made up many times over by my 9/4 on Jacqui Smith going in 2009, 6/1 on Fred Goodwin paying part of his pension back in 2009 and the 5/1 that Tony McNulty would be ordered to pay part of his housing expenses back in 2009.